Celebrate the iconic city that has your heart with this sophisticated lighting design. 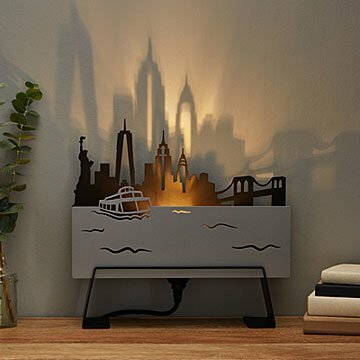 Whether it's one you left behind or a treasured vacation spot, celebrate the iconic city that has your heart with this sophisticated lamp. Simply switch on its LED bulb, and a dramatic layered shadow of your beloved skyline is cast on the wall. The design of each major city (New York City, Chicago, San Francisco, Seattle, or Boston) also incorporates their unique waterway: take in an inspired Manhattan view, for example, from New York City's Staten Island Ferry. A long, cloth-covered cord makes it easy for you to display it on a high shelf or side table far from an outlet. Made from laser-cut, powder-coated aluminum in Omaha, Nebraska. Lamp fixture made in China. Every home my husband and I were in had a direct view of the NYC skyline. Now we're moving to Long Island & I didn't want him to miss the view! :) He absolutely adores and we feel like we still have our Jersey City views on NYC with us! If you're madly in love with a city, this is the perfect reminder for it! Love the gift! My father put it in his bonus room. It looks fantastic! Not sure how well it lights up because he hasn't tried it yet. Love Uncommon Goods, but disappointed this purchase. #sweepstakes This is used for ambient light in the bedroom. This was delivered right on time. We received a beautiful thank you email stating that he loved the lamp, and also saying that he is feeling "Very positive and inspired for the next chapter of my life, albeit without vision from my left eye...my spirits are incredibly high.". I am told it is beautiful! This is used for ambient light in the bedroom. Great gift for someone who wants a daily reminder of home. Just make sure to read the dimensions. I thought it was bigger than it's actual size. My own fault for not reading the product details. Absolutely gorgeous light. The mini light placement is just right to cast perfect, stunning shadows when placed against a wall. It's an impressive piece that catches the eye. My husband jokes that the perspective of the skyline art is slightly off â€” you can't get quite that view from the Charles River â€” but we love it. I love this and my clients did, too! It's unique and very cool looking whether or not the light is actually on. It was smaller than I thought it would be, but maybe the dimensions were listed on the website and I missed it. I'll be getting this again! Absolutely beautiful! Will be buying another one!